Right now at the Boston Museum of Fine Arts (www.mfa.org), there is an exhibition entitled "Contemporary Clay: Japanese Ceramics for the New Century" that is showing until July 9, 2006. 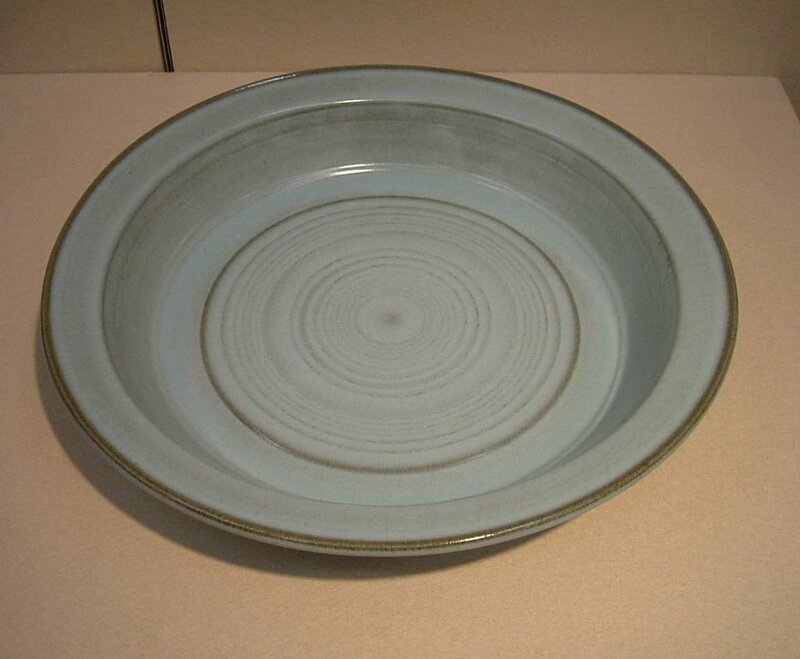 The majority of the work on display is from the private collection of Alice and Halsey North (www.northgroup.biz/ceramics/), pioneer collectors who have had the yakimono itch for about 20 years now. 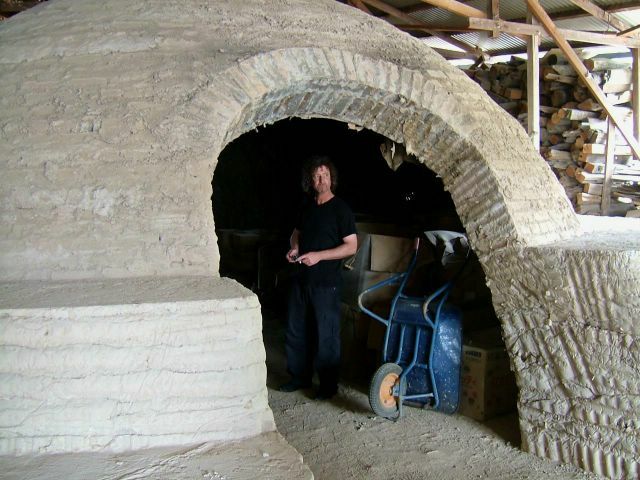 They have studied, and often visited kilns and selected works of the highest quality; their collection is as good as it gets for modern forms. The North Collection has been featured in a past issue of Kateigaho International (int.kateigaho.com) and a small portion of it is also featured in the catlaog that accompanies the exhibition. The cover shows a winged form by Shigaraki ceramic artist Kohyama Yasuhisa and all in all there are 36 artists in the catalog. Each artist has a concise two-three paragraph introduction as well as at least one color photo of the exhibited piece. 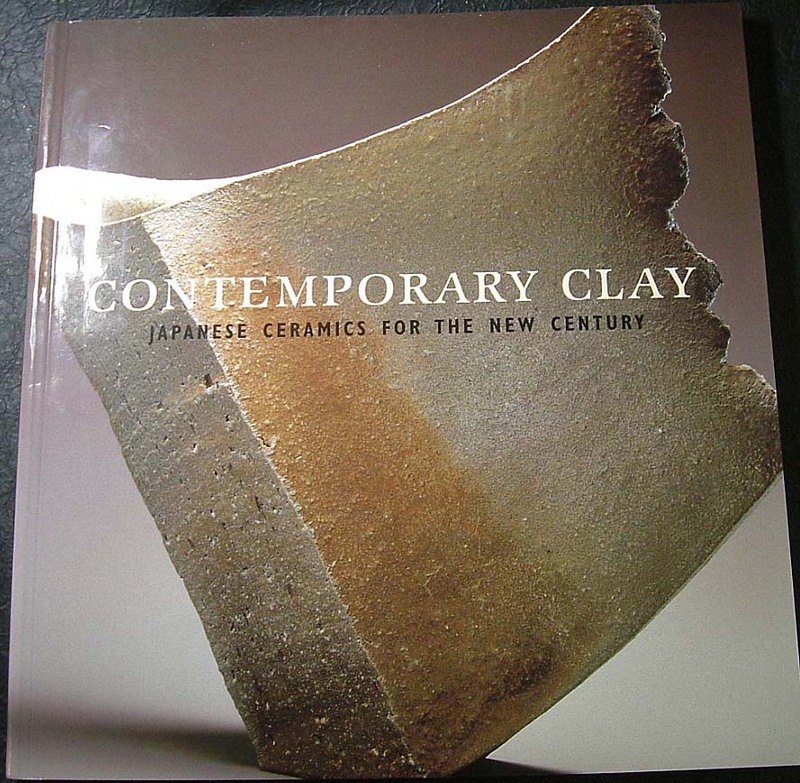 Every single piece in the book is an outstanding example for that artist, with a special emphasis on Kyoto artists. More sculptural than functional, the stlyes range from blistered Shigaraki to smooth, elegant porcelain. 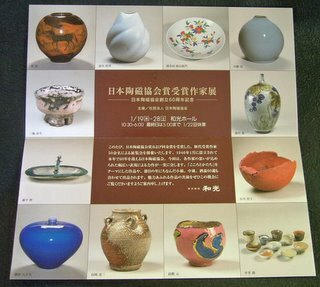 Exhibitions like this will certainly attract more collectors to the very exciting field of contemporary Japanese ceramics. The Beauty of Hidasuki Becoming Cosmetic Color?! Quite honestly, for me I really don't give much thought to how something is made, I'm more interested in the result and whether it moves me or not. Yet, I know some folks may find the study fascinating. Of all the potting centers I've visited in Japan by far I've been to Bizen (Imbe) the most. So many times I've lost count, 40 maybe......50. One of the first production kilns I visited on my first trip back in the late 1980s is called Korakuen (from my shuki column a few years back:http://www.e-yakimono.net/html/shokunin-sv.html) and is in the center of Imbe. 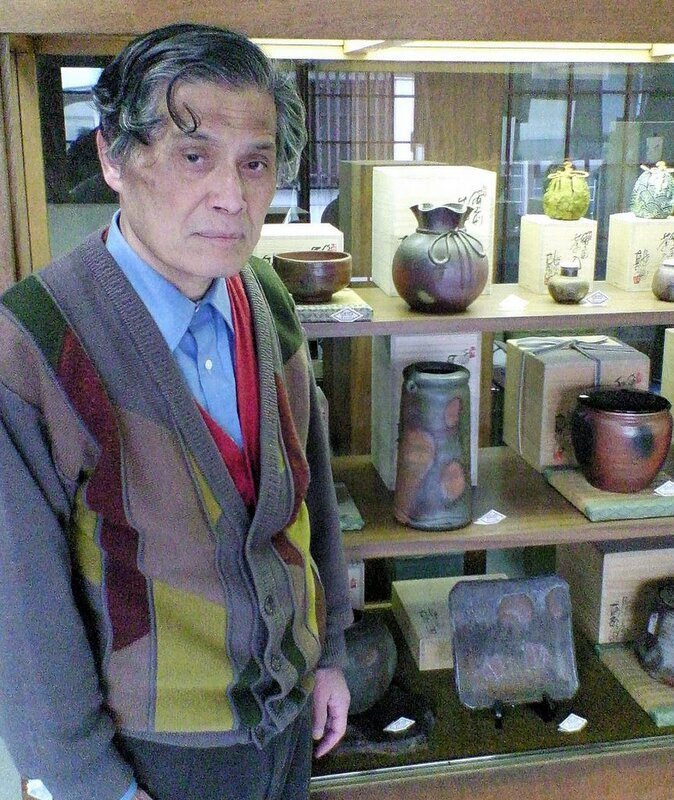 Last week I was there again and paid a quick visit to see how master potter Kimura Chojiroyukei(1930-) was. He glanced at me when I walked in and stuttered..."Ii.....ie.....ie..Ierin!(Yellin!)" As I was leaving he slipped me a piece of paper upon which he had written, 'The Beauty of Bizen; I love not the beauty of gorgeousness the less/but natural beauty more. 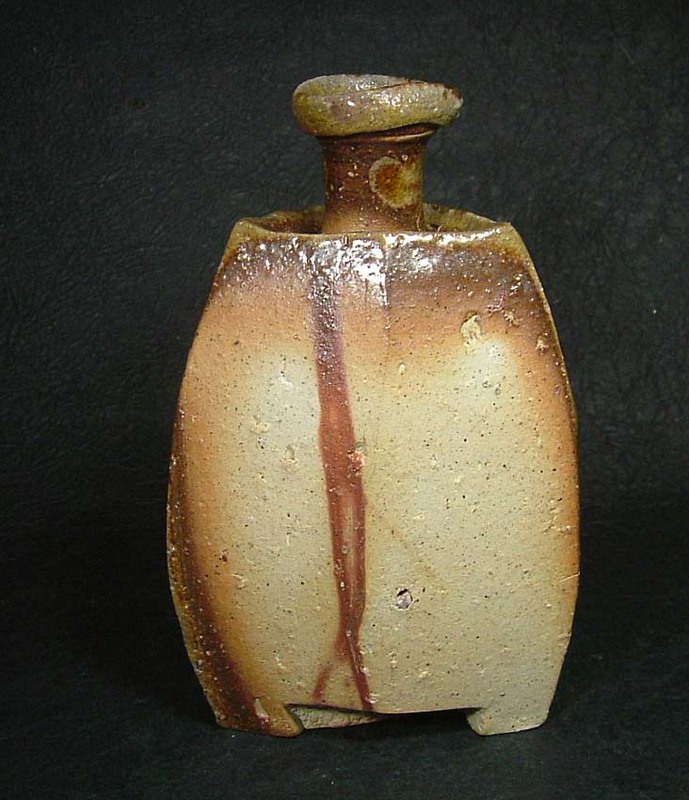 It may not be the greatest luxury, but/Quietly enjoying the naturalness of Bizen/Will surely give comfort/To your daily life.' I thought I'd share his gentle words with you. 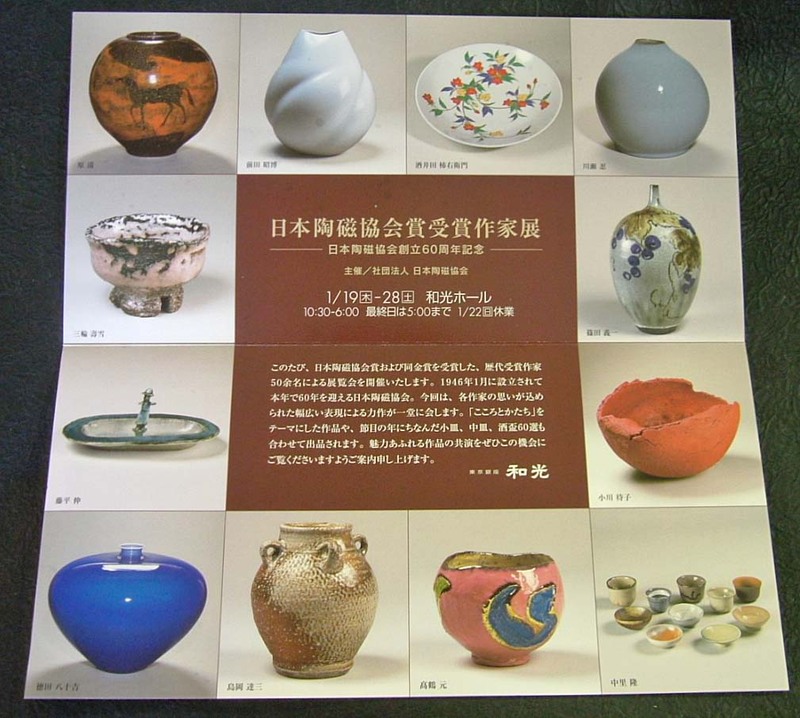 The annual Japan Ceramic Society Award-Winners exhibition will be held in Tokyo at Wako Hall, Ginza from Jan.19-28. 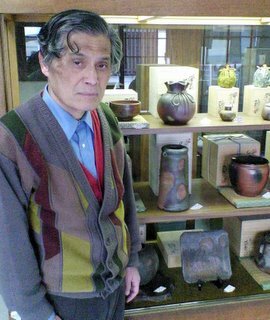 This time the exhibition will celebrate the 60th year since the JCS's founding and will feature works by 52 ceramic artists including Shimaoka Tatsuzo, Miwa Jyusetsu, Akiyama Yo and Kakurezaki Ryuichi. Please note that Wako is closed on Sunday, for some odd reason. Look for a slide show of the exhibition on www.e-yakimono.net sometime in Feb.
Robert Yellin standing in Mori Togaku's O-Gama entrance, Summer, 2004.